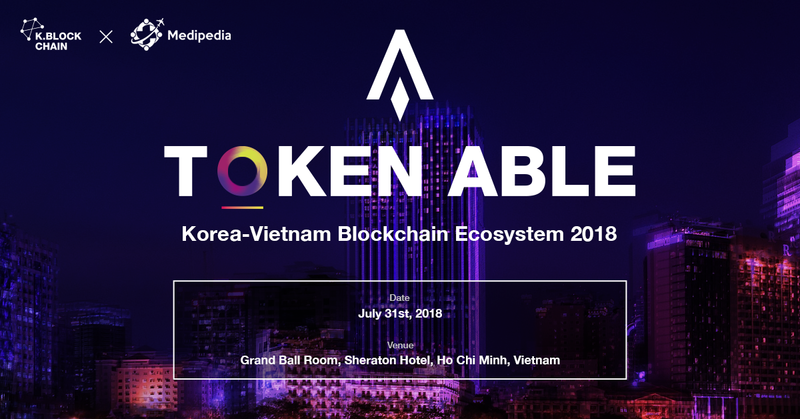 The ABLE TEAM was in Ho Chi Minh City for the “Korea Vietnam Blockchain Ecosystem” event in Vietnam. ABLE was privileged to co-host with another Korean blockchain leader, Medipedia. In a somewhat private conference including many influential key players in the Blockchain field, more than 100 people attended from South East Asia including Thailand, Korea, China and mostly Vietnam. The event was uniquely planned by the ABLE team and Medipedia for the promotion of ABLE’s global sale. The Able project has already proved itself to be logically strong in Korea by raising over 10,000ETH this year. One of our outstanding speakers was Professor Tan Dinh. He made a first speech on “Blockchain and Vietnam-Korea Blockchain Ecosystem”. He said that this period is an early stage of the blockchain industry with great potentials to grow. In other words, it has many rooms for start-up companies to grow and Professor Dinh used an analogy of what an early stage of the computer industry was like. He mentioned, “It is important to remember that the early stage necessarily includes “a standardization” period where many tests of business models with new ideas are examined and supported”. He also emphasized that investment brings responsibility of making decisions for the future, not the present. The CSO of the ABLE Project, Thomas Lee, followed up his speech focusing on the blockchain ecosystem between Korea and Vietnam. He quoted a statement from the CEO of APPLE,Tim Cook, “we must move to a decentralized economy that put humanity and human values in technology”. He added, “Token economy needs a company with purpose, social responsibility,a long-term perspective, and a strategy of differentiation through value chain management”. 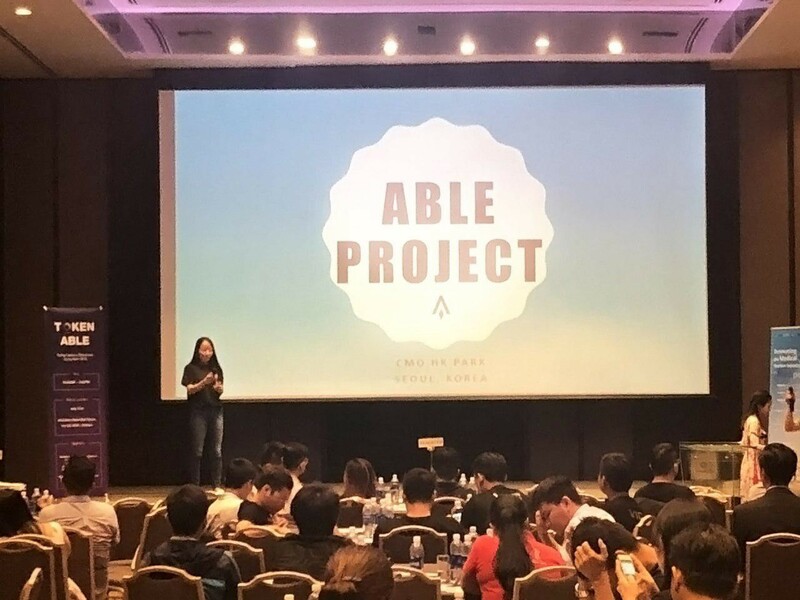 When the CMO of the ABLE Project, HK Park, made a speech on the essentials of the project, attendees paid special attentions to her with some great responses from VCs and individual investors probably because a lot of Vietnamese feel the need of more secured banking system like the ABLE platform for their next generation. Since only 30% of the Vietnam population actually possess bank account, and 42% are aware of the concept of credit cards, ABLE’s account and banking platform was a significant breakthrough to the Vietnamese. In other words, the ABLE Project opened the possibility for ‘financial activities’ in Vietnam, which coincides with ABLE’s purpose: Reducing the financial gap among countries. Meanwhile, one of the well-known investors, Alpha Whale and VBC (Vietnam Blockchain Community) showed strong interests in investing in the ABLE project. They asked many questions regarding the perspectives of the ABLE team towards the current cryptocurrency market, and how ABLE is playing a role in the future financial banking system based on blockchain. With all seats fully occupied, one of the top influencers, Don Thao Nguyen in Vietnam, Umbala, also pitched at the conference accentuating his networks and his business in the camera industry based on blockchain, and Dr. Khanh Ngo from Kaspersky Lab SEA gave a speech on Blockchain & Application development. The presenters all appealed that the blockchain business in Vietnam is very promising and suggested that it would be possible to greatly advance the time of the commercialization of the blockchain through the IT-developed Korea through conferences like this. Also, they provided this opportunity through the conference and announced a positive response to making the blockchain ecosystem of Korea-Vietnam through ABLE. The ABLE team is planning to follow up with the conference by strengthening their network they have been built in Ho Chi Minh City and individually following up with the investors through conference calls, reports, and blockchain communities. Overall, the Vietnam conference had a special meaning for two reasons: A Korean blockchain company was the host for the first time in Vietnam and it caught many attentions with strong possibilities of global investments in the future.